After all the hard work is done restoring a wood window, there is one final step: painting your window sash. Painting a window is by far the most important part of the process because it protects all the work underneath. It keeps sun, rain, dirt, insects, air and anything else from harming your window. Without paint, glazing putty is no good after only a couple months, the sun’s UV rays begin breaking down the wood fibers of the window immediately, water will cause corrosion of your glazing points. Without paint, your window will fail quickly. But you already know that you have to paint your windows, right? Maybe so, but there is a very specific way that historic windows should be painted to both protect their parts AND ensure smooth operation. Here are my 5 rules for how to paint a wood window sash. The sides of the sash that slide up and down in the jambs should be left bare. No primer and no paint. This may sound odd, but it has been in practice for well over 200 years. These areas are not seen or readily exposed to the elements so there is no cosmetic reason to paint them, but there is a more practical reason NOT to paint them. 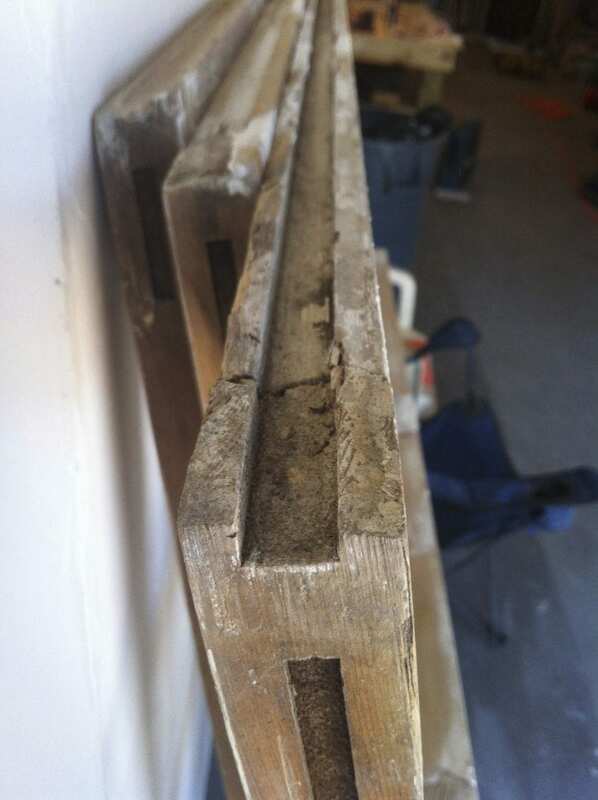 By leaving these areas bare you allow both rails (horizontal parts of the sash frame) and both stiles (vertical parts of the sash frame) to expel moisture. With these sections bare, the entire sash is able to dry out if it should happen to get wet. Bare wood breathes much, much better than primed and painted wood. In addition, these parts of the sash slide against the window jamb and if they are coated with paint (especially latex paint) they will stick and be extremely difficult to open and close. Leave it bare. For the same reasons as above the top of the upper sash and bottom of the lower sash should not be primed or painted either. These parts are not visible when the window is closed and therefore not exposed to the elements. Again, this will aid in the window’s ability to dry out. Not much else to say about this, so let’s move on. For the best performance use an exterior oil-based primer. I prefer Kilz Complete in my shop because it is hides very well, goes on easily and sands down nicely. The sash should be primed and lightly sanded with 220-grit paper to smooth out the surface before installing the glazing putty. Use a brush and work the primer into the wood. Spraying on primer is fine, but be sure to work it in with a brush as you spray. Brushing ensures a better bond between the wood and primer than spraying alone. Whether you decide to go with oil-based paint or water-based doesn’t matter to me. The point is the get at least two coats of paint on the inside and outside. Don’t skimp on this paint either. Use a top-notch enamel paint. I prefer Sherwin-Williams Porch & Floor because it is an easy to work with water-based paint and since it is formulated for floors it gets very hard, very quickly. The technique for painting your window sash is difficult to describe in a blog post, so I’ve put together a short video to show you how it should be done. Check out the video below and don’t forget that you can get more videos like this by subscribing to our YouTube channel. Once the windows are painted let them sit aside and cure for at least a few days. This may sound pretty elementary and I’m sure you would never try to put windows with wet paint back in, right? It’s not about the windows being dry. It’s about the paint having time to cure. Water-based and oil-based paints can take up to 30 days to fully cure. Until that time the paint is more prone to being damaged by scuffs, knicks, and water. Don’t try to wipe down new latex paint or clean it until that 30 days has passed. Otherwise, you run the risk of messing up your paint job. Once the paint is cured, enjoy the finished product by opening those windows as much as you’d like. You deserve it! I am staining a 100 year old window the will be used as a table. I have deglazed and removed the window panes. I have sanded the entire thing down to the natural wood. My question is, do I still use oil-based paint primer where the glass sits before bedding the glass or can I use a wood conditioner, then bed the glass, and finally stain the window? Thank you, in advance, for your feedback! On stained windows you can either seal the rabbet with shellac or apply boiled linseed oil just before bedding the glass. Thanks so much for sharing your current situation! Honestly, our best recommendation would be to use our online directory ( http://www.thecraftsmanblog.com/directory ) to find a licensed preservationist in your area who can take a look in person and provide an accurate recommendation from there. I have started my restoration project following your directions to the best of my ability and budget. I have removed my windows, and while my husband is working on those, I have been trying to sand the window jambs (the area where the window slides just in case my vocab is wrong), however I can’t get the paint to budge with sand paper. Do you have any advice on the best way to sand the jambs? I usually scrape the paint off with a ProScraper and then sand with 60 grit paper. The process causes the paint to separate from the wood so that it can easily be removed using a paint scraper. As an old home restoration contractor I disagree about not painting the bottom edge of the sash. Too often, especially up north with snow, lowest sash sitting in wet sill wicks up water into sash. End grain f rails should be sealed as well as beveled bottom of sash in wood storms and o lowest double hung sash. I am working on reglazing and painting my 1898 Victorian home windows and I have a question about paint brushes. All of my windows on the second and third stories are intricate with a diamond pattern on the top sashes with over 25 lights on a single sash. I’ve been using a 1″ sash brush, but was wondering if there’s a better (or smaller) brush for painting windows with great detail. I’ve searched online and cannot find a sash brush less than 1″. Thanks so much! I see that you suggest that I don’t prime and paint the sides of the windows. Is it okay to stain the sides? Or is it better to leave them totally bare? 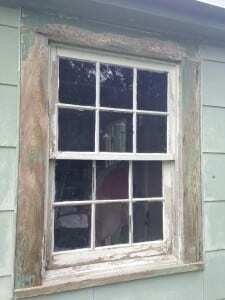 I’ve just replaced rotting wood on several of my rounded windows. I live in a 1937 house in Wisconsin. On one of the windows, I had new wood put in along the bottom third of the windows where it was rotted beyond repair. So now I have bare wood. I’ve primed and painted the outside. I’ve stained the inside. Right now, the sides are bare. Stain is fine I think. 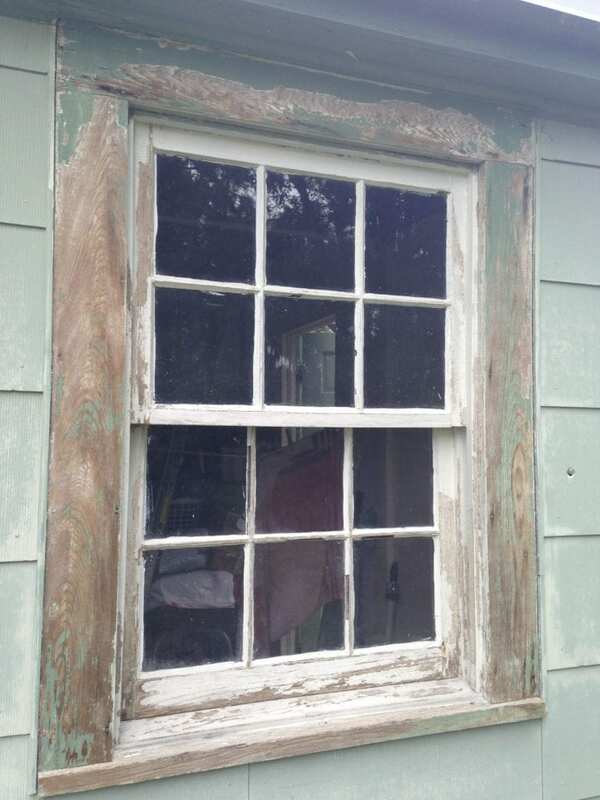 If I want to just stain and seal exterior wood window sash–NOT Paint a color–what do you sugesst? I don’t recommend staining the exterior of a wood window. It was never done historically and doesn’t perform well. It also needs a ton of maintenance. Stain the interior sure but keep the exterior painted if it is a putty glazed window. 1. I see that you recommend Sarco putty for the glazing. The people making my windows use Wonder Putty glazing compound. Is there any difference? They both require the use of an oil base paint. 2. I plan on using an oil based primer (Zinsser Cover Stain) and then a high quality latex such as Benjamin Moore, Sherwin Williams or Dunn Edwards. If I do use a putty that requires an oil based paint, could I just go over the putty glaze with the oil based primer and then paint over the glazing with a water based latex finish coat? Or do I need to use an oil based paint on the just the putty glazing, then go over everything with a water base primer and finally go over everything with a latex water based finish coat? I’m not familiar with Wonder Putty but most linseed oil putties (Sarco included) actually do not require priming and can be coated with oil or latex. We prime the sash with oil based primer the glaze the top coat with 2 coats of latex paint with fine results. In the video, you are painting a window that’s sitting in your workshop. But…how do you paint a window that is hung already? Are there any tricks to painting the little bits that are facing away from you or between the windows? Mine is a single-hung (only the bottom slides up and down), so there’s a bit of the inside of the top window that’s basically inaccessible from anywhere, and visible when the window is open. Since the window was natural wood, and now it’s painted white, that’s quite a contrast. Is there anything that can be done to paint those overlapping sides? There is really no trick to painting them in place. You just do the best you can. That’s why we remove the sash. It makes the painting much easier.